Why am I edgy as an eggshell? Am I doomed to be a tragic desperado my whole life? Am I normal? Or am I mad - if I'm not, why am I being kept awake at night by a hyperactive geriatric chinchilla and indecent visions of Gareth Stingecombe wearing his dad's Britney Spears boxer shorts? What it all comes down to is this: Will I ever actually do it? Firstly I'd just like to say a big thank you to Macmillan Children's Books for sending this review copy to me. Thank you very much! I really like the cover of this book. I love the bright colours, they really make the book stand out. Also I really like all the doodles around the title, it just makes you want to pick up the book and read it straight away! I think this book was amazing - seriously, this book was so addictive! I liked the way that the titles were totally random, so you'd have to keep reading to see what it meant. I got through this book in about three hours, it was fabulous! 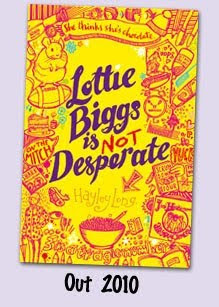 This novel is about a teenager called Lottie Biggs. Her life is one big rollercoaster - there are ups and downs, good things and bad things, and occasionally thoughts about boxer shorts with Britney Spears on them. I think Lottie copes with life very well, and if she were real, I'd definitely be her friend. Lottie and Goose (her best friend) have a bit of an argument in the middle of the novel, but luckily in the end they make up. This book is hilarious - it had me grabbed from the beginning. I could go on and on and on and on and on about this book, but I won't, because then my review would take up the whole first page of my blog! I'll just say that you definitely would not regret it if you bought this book - in other words, go and buy it now! You will LOVE IT. My favourite character was Goose because she was very funny and was there for Lottie. Until the middle of the novel when Goose and Lottie had an argument...but I won't say anything about that, you'll have to read it! It was a nice, short read, perfect for if you've got a busy day but want to fit in some reading etc. Overall I give this book 4/5 - it was fantastic! I still haven't read the first book, but I want to! I loved reading your review - thank you!